Click here for a list of our official Savage Worlds licensees, our Aces! If you’d like to use the Savage Worlds game system for your own materials, there are currently three ways to do so: the unapproved Fan license, the Savage Worlds Adventurer’s Guild on OneBookShelf.com (including DriveThruRPG.com and other platforms) and the official license for our Aces. 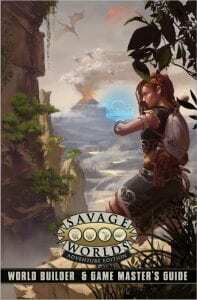 1) Pinnacle Entertainment Group grants to the licensee the non-exclusive, non-assignable license to reference the Savage Worlds Rule System in their game, adventure, supplement, sourcebook, or other product. 2) The licensee agrees to use, unaltered in size or dimension, the “Savaged Worlds Fan” logo on the front of the game packaging, manual, CD cover, “Splash Page”, or other “front” display. A high-res PSD of the logo can be downloaded here: Savage Worlds Fan PSD. 3) The licensee agrees to place the following notice in a legible format and a conspicuous location. 5) The licensee agrees not to reproduce material from the Savage Worlds rulebook or any other copyrighted work without the express written consent of Pinnacle Entertainment Group or the copyright holder. 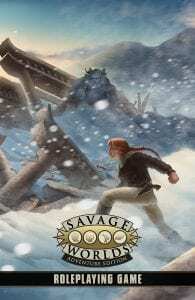 6) Pinnacle Entertainment Group reserves all intellectual property rights to Savage Worlds, including, but not limited to, all copyrights, trademarks, hobby game, publishing, entertainment, licensing and merchandising rights. 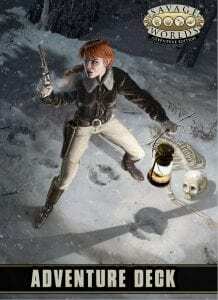 7) Pinnacle Entertainment Group reserves all rights to its Intellectual Properties, including those used as examples or illustrations in the Savage Worlds rule book, promotional material, or published works. This license does not allow any derivative works based on other Pinnacle products, lines, or properties (such as Deadlands, Weird Wars, Necessary Evil, etc). Neither does the license allow works based on licensed properties published by Pinnacle (such as Lankhmar, Flash Gordon, Rifts®, or any other). The user of the license agrees to be responsible for obeying the laws regarding the Intellectual Property of any other entity. 8) The licensee agrees not to charge or accept compensation for the product in any way, shape, or form. 9) Pinnacle Entertainment Group reserves the right to revoke or alter any aspect of this license as it deems necessary. Within the Savage Worlds Adventurer’s Guild (commonly called SWAG) you will find—and create—new and original content by individuals across all genres and from around the world for the Savage Worlds roleplaying game. Feel something is missing, or have a sparkling idea? Take the opportunity to publish it! For further information please visit our SWAG page at OneBookShelf.com. If you want to sell your work, you must apply with an email to PEGlicensing@gmail.com. Once we grant your company the license, you can make whatever you want without submitting it for further approval, as long as you follow the guidelines below. Be aware that we’re looking for HIGH production values–meaning great art, trade dress, and professional layout–as much as we are great content. We recommend an introductory email with a link to a file containing sample layout and art with any new Edges, Hindrances, or Setting Rules in it, as well as a few sample characters. See SomeInitial Advice below for more details. This copy of the license is for display only. Once you are approved you will sign and file the official agreement with these same terms. 4) Licensee indemnifies Licensor against all loss, damage, injury, and expense, including reasonable attorney’s fees, from any breach of this Agreement, including but not limited to intellectual property laws. 5) The licensee agrees not to reproduce unauthorized material from the Savage Worlds rulebook or any other copyrighted work without the express written consent of Pinnacle Entertainment Group or the copyright holder. For a detailed list of Authorized Material from Pinnacle Entertainment Group, see Licensee Authorized Material. 6) Pinnacle Entertainment Group reserves all intellectual property rights to Savage Worlds, including, but not limited to, all copyrights, trademarks, hobby game, publishing, entertainment, licensing and merchandising rights. This license does not allow derivative works based on other Pinnacle products, lines, settings, or properties (such as Deadlands, Weird Wars, Necessary Evil, etc). Nor does the license allow works based on licensed properties published by Pinnacle (such as Lankhmar™, Flash Gordon™, Rifts®, or any other). Pinnacle Entertainment Group reserves all rights to its Intellectual Properties, including those used as examples or illustrations in the Savage Worlds rule book, promotional material, or published works. 7) The licensee agrees to pay a 10% net royalty on all Licensed Products published on or after September 4th, 2018, on One Book Shelf-affiliated sites (such as DriveThruRPG, RPGNOW, etc), using the automated tools therein. No royalties are due on Licensed Products sold elsewhere, such as crowdfunding platforms, the licensee’s own website, physical product, etc. 8) Licensee agrees to send Pinnacle Entertainment Group one complimentary copy of each Licensed Work in digital format (PDF). Pinnacle shall have no right to sell, share, or distribute the Licensed Product outside of its company or assigns. 9) Pinnacle Entertainment Group may, from time to time, share information marked CONFIDENTIAL with licensee. Confidential material may include game designs, rules, expansions, marketing, business policies or practices, release dates, and settings. Licensee agrees not to share, recite, post, or reveal such information outside of its development staff, until such time as Pinnacle expressly allows, it becomes publicly available, or in accordance with judicial or governmental order. 10) If either party employs attorneys to enforce any rights arising out of or relating to this Agreement, the prevailing party shall be entitled to recover reasonable attorneys’ fees. This Agreement shall be construed and controlled by the laws of the State of Arizona, and both parties further consent to the exclusive jurisdiction by the state and federal courts sitting in the State of Arizona, County of Maricopa. 11) Pinnacle Entertainment Group reserves the right to revoke or alter any aspect of this license as it deems necessary. The first questions most potential new licensees ask are usually pretty similar. Here’s some advice to help you down the path a little quicker. It’s especially helpful if you have all the below in a nice tidy package with your application email to PEGlicensing@gmail.com . Start by telling us about your setting. Don’t go into much detail—just give us the gist of what it is so we can look for any red flags like it being too close to an existing setting or too graphic/mature for our fans. After that, we like to see some sample text. If you have new Edges, Hindrances, or Setting Rules, that’s a good place to start. We can see your writing style and make sure you “get” our rules system. * It also gives us an indication of your ability to self-edit. Art: If you can’t afford your favorite, well-known artist at this point, you might want to check out sites like www.deviantart.com. There are lots of amazing artists out there who haven’t been discovered yet and may work with a new company. Layout and Trade Dress: You should be doing your layout in InDesign or Quark. If you don’t have that ability (or have a friend with those skills), you might try contacting a company like Savage Mojo, who has done both Art Direction and Layout for other companies. We only need to see a few pages here—not a complete, final product. If you are thinking about converting existing game material from another system, there are a few things to keep in mind. A good conversion is not about a 1:1 tradeoff of this ability to that Edge. Capture the feel of the setting, not the mechanics. Each game system has an inherent philosophy, and ours is Fast! Furious! Fun!. If the rule doesn’t fit all three, it needs to be fixed. What happens next varies depending on your strengths and plans, but these first steps are pretty common for everyone. If you have any questions, contact PEGlicensing@gmail.com. And thanks for keeping it SAVAGE! * Designing rules to be streamlined and clear for the user is harder than it might look on the surface. Look at the Chase Rules, for example. They’re a page long and quite simple when you read them. But designing them took a long time and a lot of playtests. They handle everything from a foot chase to battles between fleets of star cruisers. And they work pretty well, too. Even Edges & Hindrances are like that.